Recently I completed a mental health first aid course and thought I would share some of my learnings over the coming weeks. It is important to share some of these statistics so that we can continually stay focused on the ultimate aim of Active Farmers - to improve the mental health of farmers and community residents in regional areas. The first statistic I would like to share is that 45% of the entire Australian population will suffer form some form of mental illness in their lifetime (source Mental Health First Aid Guide 3rd Edition). 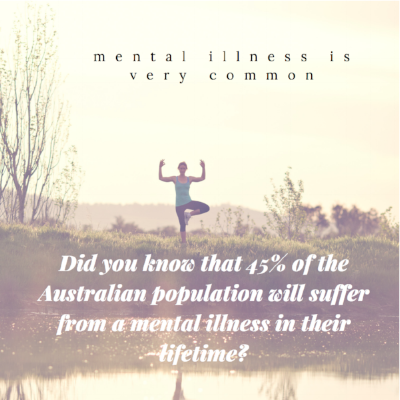 This statistic to me, demonstrates how normal it is to suffer from a mental illness, however the perception in my view is that in regional areas is not inline with this statistic. At Active Farmers we want the regional population to understand these type of statistics in aim of improving mental health prevention and awareness. We know that by improved physical health and social interaction mental health naturally improves, therefore given the high prevalence of mental illness we want to implement the PROACTIVE Active Farmers service into as many country towns as possible to help the large amount of people suffering. Remember how normal it is to suffer and share this statistic with your friends and family!